Gilgamesh (ギルガメッシュ, Girugamesshu?) is a recurring character in the Final Fantasy series. Initially introduced as a minor villain, he has made a number of appearances in remakes and later titles. 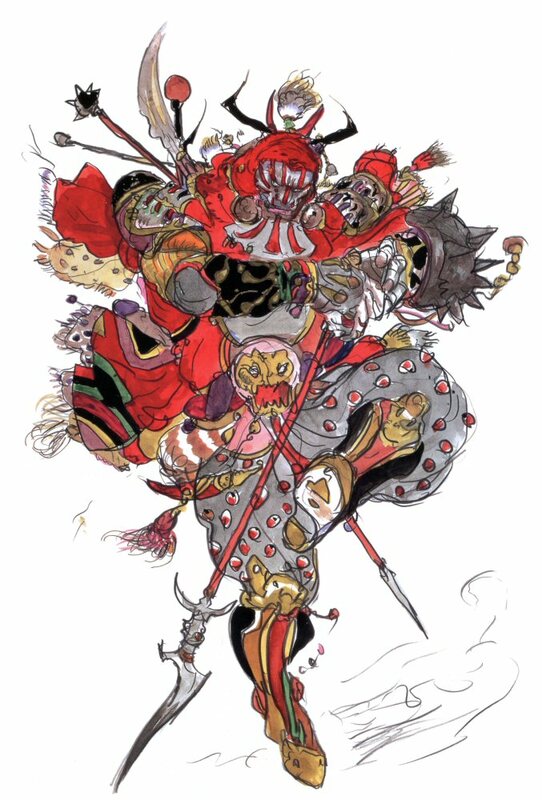 To date, Gilgamesh has had more appearances in any Final Fantasy media than any other character, and may be the only character to appear in more than one game in the main series (see below). Gilgamesh began a tradition of an incompetent, comical, yet persistent recurring boss for the player to face. Gilgamesh’s role has varied greatly, from ally, to enemy, to summon, but for most of his appearances he is a traveling sword collector that battles with a variety of rare and powerful weapons. In most, if not all, of his appearances, Gilgamesh is searching for the legendary sword, Excalibur. Another of Gilgamesh’s trademarks is Genji Equipment, which can be stolen from or dropped by him. Originally voiced in Japan by Daisuke Gori for the Japanese release of Final Fantasy XII before his death on January 17, 2010, Gilgamesh’s voice is provided by Kazuya Nakai as of Dissidia 012 Final Fantasy. In the English versions, Gilgamesh is voiced by John DiMaggio in Final Fantasy XII, and Keith Szarabajka in Dissidia 012.